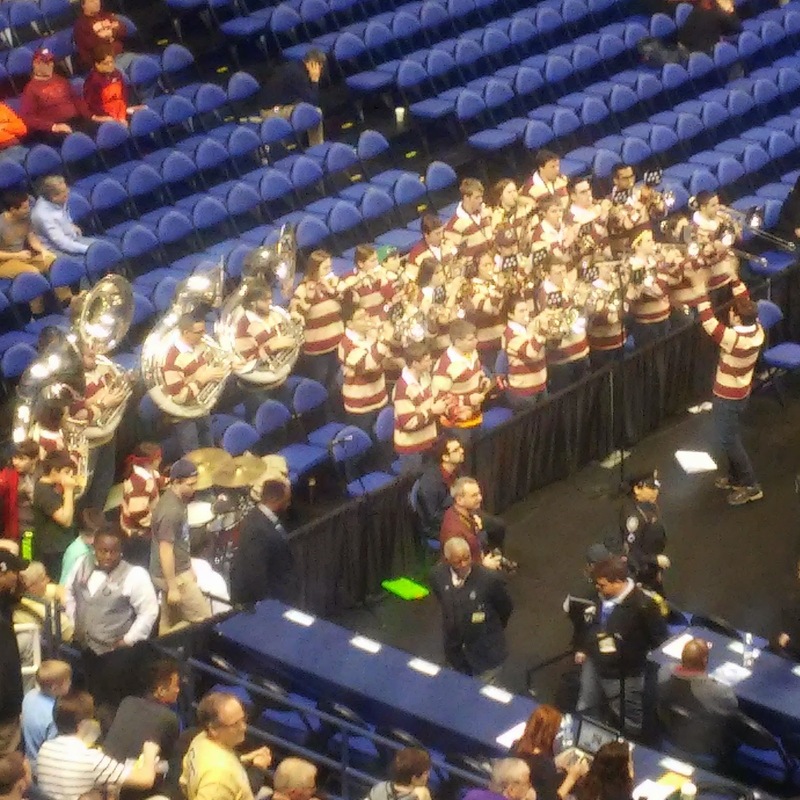 Whether attending games live or longing for the fleeting glimpses of pep bands while watching the NCAA basketball tournament, you may have noticed a certain uniformity in the bands. While every band has their own look, style, and swag, they've all got one thing in common: No more than 29 members. Tournament rules cap the number of band members that can attend, which presents a challenge for larger bands, especially those that hail from schools where basketball, not football, is the banner sport. The NCAA also forbids electronic instruments, meaning that bands who may feature electric guitars, basses, and keyboards in their own arena have to leave those instruments - and often those players - home. The folks over at College Marching have begun a petition to change this, increasing the number of players from 29 to 40, and including electronics. I could honestly go 50, but regardless, I'm 100% behind the proposal. Why cap it at all? I see two key reasons: The first is sheer arena logistics. As important as the bands are, their interests need to be balanced with paid butts in seats. The other is that a standardized number prevents a David vs. Goliath in the stands between the two bands sitting 94 feet apart. Some bands have more resources - a marching band, a large student body - that allow them to put dozens if not hundreds of students into the stands. Limits ensure the band under the other basket can stack up. That said, much in the manner I believe any athletic director should plan to send the marching band to any postseason football, they should also plan to send the pep band - whatever iteration of it plays in your home arena - to the conference and NCAA tournaments. If that number exceeds the cap, the additional players can add to your student cheering section, and hopefully get the chance to play behind the starters if the team advances. My stance on electronics may surprise some who know I'm pro-acoustic instrumentation, but marching band and pep band, while related, are different worlds. A pep band's form and instrumentation may be that of a marching band, a jazz combo, or anywhere in between, so a rhythm section featuring keys, bass and guitar is entirely within bounds. I even love to see some of the more unorthodox instruments like electrics strings. In college, I remember going to the NEC tournament in the year that our pep band added an electric bass player. She had been a hit at home, but we learned only after we got to the tourney site that her amp wasn't welcome as part of our ensemble. Imagine playing in support of your team all season long only to learn that on the biggest stage, you've been sidelined. Pep bands are already miked in the tournament; including electronic instruments won't change the profile in that regard. Few would argue that the men's basketball tournament is the highest profile event the NCAA does from year to year. It's time to get more their "one shining moment." If you agree, join me in signing the petition to #ExpandTheBand.